Throughout the long hot summer of 1940 the villages and towns of south east England found themselves in the front line as the Battle of Britain raged high above in clear skies. Crash-landed in the corner of a Sussex field, a German Ju88 of KG30 is an uninvited visitor. 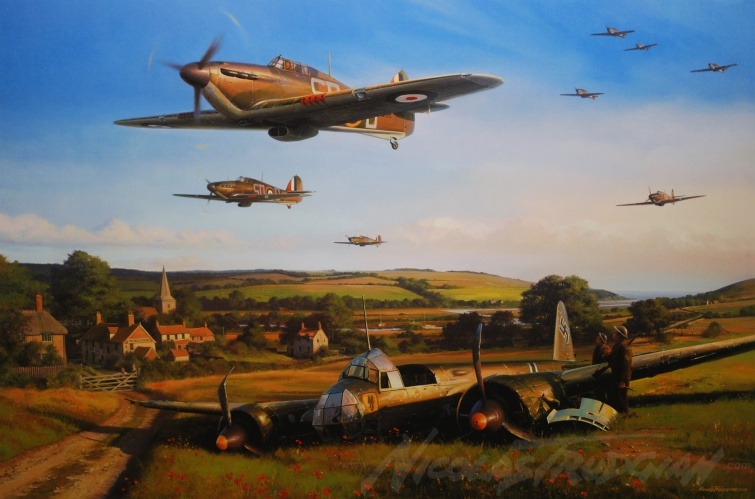 More welcome are the Hurricanes of 501 Squadron as they roar low overhead, racing home for fuel and ammunition. Within minutes they will scramble aloft again to rejoin the battle.